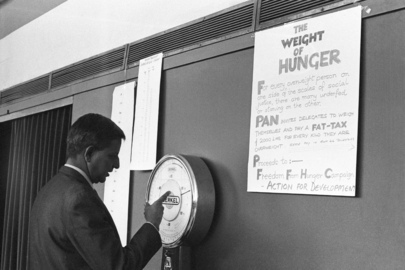 The "Universal Declaration on the Eradication of Hunger and Malnutrition" was adopted at the World Food Conference on 16 November 1974. The World Food Conference was convened under General Assembly resolution 3180 (XXVIII) of 17 December 1973. The Declaration was endorsed by General Assembly resolution 3348 (XXIX) of 17 December 1974. UN Photo/F. Iovino: A delegate tries the Fat-Tax scale in the delegates lounge at the Palazzo dei Congressi, Rome, where the Conference is being held. The United Nations Conference on Food and Agriculture was held from 18 May to 3 June in Hot Springs, Virgina (USA), with the participation of 44 governments. Convened by US President Roosevelt, the Conference decided on the establishment of a permanent organization in the field of food and agriculture. The first session of the FAO Conference met in Quebec City, Canada, establishing the FAO as a specialized agency of the United Nations. The first World Food Conference was held in Rome on 5-16 November 1974, where governments examined the global problem of food production and consumption. The FAO Committee on World Food Security adopted the Plan of Action on World Food Security at its 4th session, Rome, 5-11 April 1979. By adopting GA resolution A/RES/35/70, the UN welcomes the observance of World Food Day annually on the 16th of October. In December 1992, the Food and Agriculture Organization (FAO) and the World Health Organization (WHO) organised the first International Conference on Nutrition, in Rome, Italy. World leaders assembled in Rome in November 1996 for the World Food Summit. The FAO called the Summit in response to widespread under nutrition and sought to renew the global commitment to the fight against hunger. The Declaration was a new global partnership to reduce extreme poverty and hunger and came to be known as the Millenium Development Goals (MDG). Goal 1 includes a commitment to halve the proportion of people who suffer from hunger by 2015. The World Food Summit: five years later held on 10-13 June 2002 reaffirmed pledges to end hunger. The outcome document is: "Declaration of the World Food Summit: five years later. The HLTF was established by UN Secretary-General Ban Ki-moon in 2008. The Task Force is chaired by the UN Secretary-General and the FAO Director-General is Vice-Chair. World leaders unanimously adopted a declaration pledging renewed commitment to eradicate hunger from the face of the earth during the World Summit on Food Security. The Zero Hunger Challenge, an initiative by the UN Secretary-General, invites all countries to work for a future where every individual has access to adequate nutrition and resilient food systems. The Food Assistance Convention, an international treaty, was adopted on 25 April 2012 in London. The treaty aims at "addressing the food and nutritional needs of the most vulnerable populations". The Second International Conference on Nutrition was held in Rome, Italy in November 2014 and adopted the Rome Declaration on Nutrition, committing countries to eradicate hunger and prevent all forms of malnutrition worldwide. The Meeting addressed food security and nutrition from multiple angles: the importance of promoting sustainable approaches to agriculture and fisheries and building resilience to climate change and disasters; the benefits of improving rural livelihoods of smallholders and family farmers. The UN summit for the adoption of the post-2015 development agenda, a high-level plenary meeting of the General Assembly, was held from 25 to 27 September 2015 in New York. Sustainable Development Goal 2 aims to end hunger and all forms of malnutrition by 2030. During the high-level side event to the 71st UN General Assembly, conversations about achieving Zero Hunger and the Sustainable Development Goals by 2030 were held. This page provides access to outcome documents from major food-related conferences between 1974 and 2002.